Total distance: 1000 km (625 mi). Ferry crossings are marked yellow. The tour began in Holland. We took the train to the Amsterdam Central train station, right in the center of Amsterdam. We had a reservation at the International Budget Youth Hostel, Leidsegracht 76 (020-6242784). I picked it from the hostels advertising on the Internet, and it turned out to be an excellent choice. Small but central, in an area less crowded with tourists but plenty of restaurants and shops. We spent two days in Amsterdam, mostly walking around town. Amsterdam downtown consists of canals (grachten) forming concentric half-rings with the train station at their focal point, with numerous radial canals and bridges. The whole downtown manages to be uniformly charming with its narrow, paved streets and narrow old houses. Nearly everybody rides incredibly decrepit bicycles (to prevent theft) with massive locks. We left our bicycles locked in the hostel. 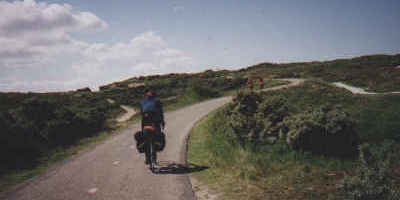 We left Amsterdam to the west, along the Haarlemmermeerpolder, and reached the channel coast near Noordwijk. Holland has a dense network of bike paths, most of which isn't shown on the Michelin maps. Paths are usually paved with small flat stones, which makes them less than perfectly smooth but still comfortable to ride. The path shown in the picture is divided into a pedestrian lane, a bicycle lane with occasional speed bumps, and an equestrian lane. They are thoughtfully routed, without dangerous intersections and unexpected merging with motor traffic, wide and well-maintained. In other words, perfect. They do, however, usually stop at city limits. We didn't want to go through Rotterdam, so we crossed over at Maassluis. As usual there was a flawless bike path. After taking the ferry to Rozenburg we followed the N57 road through four narrow islands connected by dams, through Brielle, Ouddorp (where we stayed in a small hotel), Renesse, Haamsteede, Delta Expo, Middelburg, and Vlissingen. We didn't actually ride N57 but on bike paths or small streets; there are signs showing the way. Quite obviously someone has thought carefully about how to best get from here to there by bicycle. The bicycle routes are practical and not at all like those ``recreational'' paths one finds in other countries that go nowhere and disappear whenever they might get in the way of motorized traffic. Holland is a cyclist's heaven. 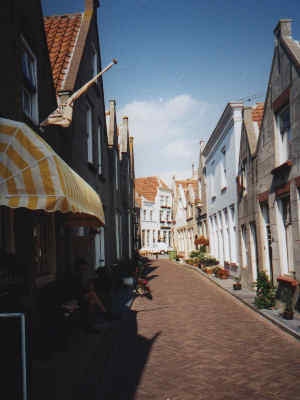 The top picture to the left shows a small street in a Dutch village with the usual paved surface. At the left side is a bakery. The bottom right picture shows a road on those narrow islands, close to one of the dams that connect the islands. We took the ferry from Vlissingen to Breskens. As before ferries ran frequently and are cheap for cyclists. We went through Groede to Sluis near the Belgian border. There was a rather abrupt change after entering Belgium; the cyclist's heaven ends just after Sluis. We decided again to bypass cities like Brugge or Brussels, and followed the coast. Only there were no bike paths; all we could do was using less busy side roads from Blankenberge, De Haan to Oostende, then on the N318 to Middelkerke, Nieuwpoort (a problem because we had to detour around the harbor), then on N396 past Veurne and De Panne into France. After leaving Holland we didn't really find a good reason to stop anywhere in Belgium - it was all asphalt and concrete and car traffic, and ugly and boring towns. I am sure that there are beautiful places in the Belgian countryside, but I can only warn people to stay away from the coast. 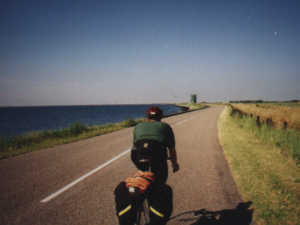 We rode all the way from Middelburg to Dunkerque in France in a single 175-km day. 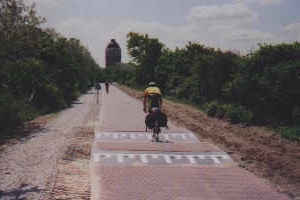 (29 May 2002) I received recommendations to ride in the Flanders region of Belgium, which is supposed to be beautiful and quite unlike the nasty coastal route. In particular, we should have followed signs Noodzee cycle route and Noordzee fietsroute from Sluis to Boulogne. I'll check it out next time. Until now we had a nice tailwind and sunny weather, but in the Normandie the weather turned against us, with a strong headwind and lots of rain. The weather in Europe is always unpredictable but now it got uniformly unpleasant, and stayed that way until the end of the trip. Perhaps this makes my memory of the Normandy more gray than it would have been otherwise, but it seemed rather uninteresting - I can have a prettier countryside with more vegetation here in Brandenburg any day. Anyway, we wanted to avoid Calais, one of the major ferry harbors to England and close to the French end of the channel tunnel, and all the traffic it attracts. 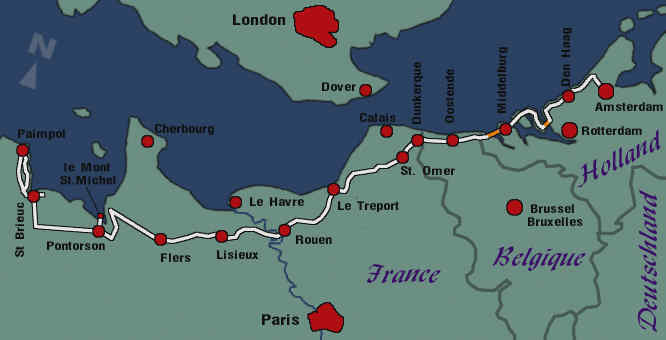 So we went south from Dunkerque, to St. Omer, and from there to Brimeux near Montreuil to Eu near Le Treport. We used small roads like D928 and D129; we managed to stay away from motor traffic most of the time. The next morning the cloudy weather turned into rain, and the terrain became more hilly. 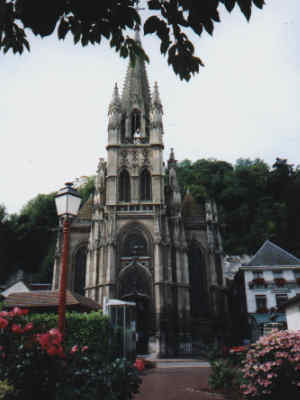 The next stop was Rouen. We saw the busy industrial part of Rouen with nothing much to look at, but apparently it has a nice historic downtown. The youth hostel listed in this year's IYH guide had been closed for a long time but we found a small hostel in the southern part of downtown. The next morning we got to admire Shell refineries alongside the Seine river for several kilometers. After the Shell refineries we were treated to some Renault car factories until we finally reached la Bouille at the Seine river, a small pleasant village shown in the bottom right picture. We followed the N175 to Bourg-Achard, Montfort, Lisieux, and Falaise, where we we just about ready to use a train to avoid the rain, and we would have if they had had a train station. 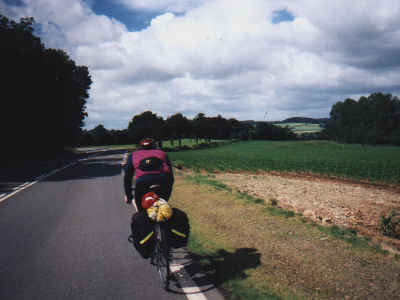 We found a little hotel and continued to Flers the next morning. There is little to tell about all this; the roads are fairly boring with little vegetation. In Flers we finally managed to catch a train to Pontorson, which wasn't very far away at that point but we just didn't want to get wet again. 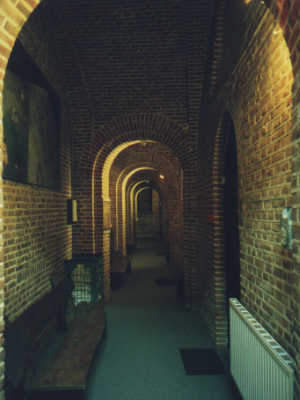 Pontorson has a youth hostel that looks pretty on the outside and like an abandoned mental institution on the inside. It is the most amazingly inhospitable place I know, with plastic mattresses and bedframes of the kind one finds in old hospitals, rubber wheels on the side and all. Its single redeeming feature is its proximity to le Mont St. Michel, a small island completely converted into a monastery, a major landmark and tourist center. Don't miss it. Read more about it on my Loire/Bretagne tour report. Pontorson is close to the Bretagne (Brittany) border. Our next destination was St. Brieuc in the Bretagne, another trip we shortened by train after getting rained on in le Mont St. Michel. We stayed at my aunt in Yffiniac near St. Brieuc and cured our developing colds, except for a small day trip to Paimpol to the north of St. Brieuc. This tour demonstrated once again that St. Brieuc is virtually unnavigable without a good compass, and I think I would still be lost there without my GPS receiver, one of its few applications on this trip. 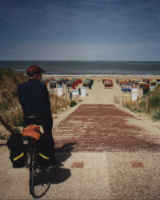 All in all, while I recommend all my bicycle tours in these pages, I'd give the Normandy and the Belgian coast low marks in comparison to the rest. Spend more time in Holland instead, or in the Loire area of France. There is much more to see there.